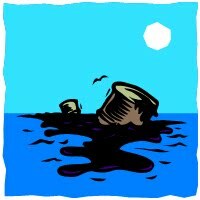 Weeks into the oil spill in the Gulf of Mexico we still don’t have a handle on what the final cost of the BP disaster will be. Maybe BP is large enough and a strong enough company that it can pay for all the damage. Maybe not. It is clear to me is we need an upfront mechanism for the extraction industries to prefund the possible environmental costs of their extraction. To take another example, which happens to be closer to my home, Rio Tinto (and their subsidiary Kennecott) plan to open a hard rock (sulfide) mining operation in the Yellow Dog Plains of Michigan’s Upper Peninsula. Kennecott claims they will not pollute the groundwater. Their opponents point to history; no completed hard rock mining operation has NOT polluted the groundwater. Since the mine will in all likelihood proceed (and until I am willing to give up using the minerals they will extract I can’t in good faith object to mines in general) I think the government should require Rio Tinto to post a multi-billion dollar bond to clean up any and all groundwater or other environmental contamination. If X-years (not being an environmental scientist, I don’t know how long it will take for the pollution to show up) after the mine’s operation there is still no pollution, the government can release Rio Tinto of their bond obligations. Implementing this program will increase the costs of extraction, which will cause the minerals or oil or gas or whatever to initially cost more. It shifts the burden of the costs to the current users of the extracted material. Under the current regulatory situation, environmental costs are shifted to us years later in the form of Superfund sites, polluted drinking water, ruined saltwater marshes and depleted seafood stock. We always pay for the damage, it is only a question of who and when. I think the costs should be recognized at the same time as the natural resource is utilized. What if the bond price is too high for one company to afford? They’ll have to form consortia. Big companies develop consortia all the time to share other risks, why not for environmental risks? If we recognize the environmental costs of extraction while the material is being removed from the earth, we will develop a fuller understanding of the true economic cost differences between (for example) oil versus solar farms. As long as we need to use the natural resources we get from drilling and mining we will have the resulting environmental damage. Let’s be honest about the costs and account for them in a proactive manner.